As I’ve stated before on this blog, footwear is the category of gear that excites me most. Each season, I wait with bated breath for the new shoe models and shoe technology being introduced by various outdoor manufacturers. Last year, I decided to make a post about the five models that I was most looking forward to, and nine months later, it’s my most popular post to date. I followed up with another five I was excited about, as well as a post on the five shoes I was considering for the John Muir Trail. Needless to say, these other posts were pretty popular as well. Due to the popularity of the shoe posts from this past year, I have decided to make another. This year, I give you the 10 most exciting lightweight hiking shoes for 2016! See my new post for 10 more exciting lightweight hiking shoes for 2016! The La Sportiva Akasha is a new model being released for 2016. It’s built for ultra long distance running and is their most cushioned in the line up. 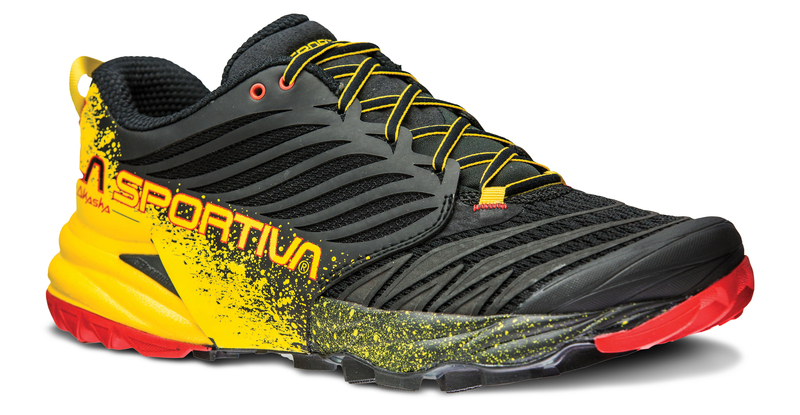 Having worn and loved the La Sportiva Mutant and Ultra Raptor, this is the shoe I am most excited about for 2016. It seems to have taken the best elements from both shoes, welded them together, and then added a brand new Frixion Red outsole. The Frixion Red is a versatile outsole built for all mountain conditions. I can’t wait until these hit shelves. I wish I had a connection with La Sportiva, because I’d love to get my feet into these as soon as possible. Just like the S-Lab version of the Wings, the standard Wings is also getting a complete makeover. Almost all of the changes that were made to the S-Lab Wings are being carried over to this non S-Lab version. To start, the upper is moving to a seamless fit, with welded overlays and a welded toe cap. This version will also include Salomon edo-fit on the inside, and sensi-fit on the outside. The outsole has the new trapezoidal lug configuration of the S-Lab version, and the inclusion of the Pro-feel film rock protection. The major difference I’m noticing for the Wings Pro 2 is the plastic stabilizer chassis that they removed from the S-LAB version. It only looks to extend to the heel though, as the old version ran through the midfoot. Much like the Akasha, this is a shoe I cannot wait to get on my feet for 2016. This shoe is an incredibly innovative piece of footwear, as it is designed to be a mountain bike tire for your feet. Named after the popular Continental tire, the X-King, it is actually a collaboration between Adidas and Continental on this shoe. All of the overlays are heat pressed onto the mesh upper for a seamless fit. The midsole for this shoe is completely removable. Without the midsole, it is a completely flexible skin of a shoe, but when added, makes it just like any other trail shoe. This is huge, as it will allow someone to change the cushion and stability with different midsoles. This isn’t something they haven’t talked about with the X-King yet, but I’m sure that option will be coming soon. For anyone who has been hiding under a rock the past few years, I’d like to introduce you to Hoka One One. They have completely taken over the wold of ultra running, and have set their sights on hiking next. Hoka came to the market when minimal shoes were still in vogue. Since then, the minimalist shoes have completely decimated the once thriving minimal market. Many thought the shoes were a joke and would never sell. That is, until the tried them on for a run. The only problem with the Hoka running shoes for hikers is that the midsole is a little too soft, which causes instability. This is also a problem that is caused by the high stack height. Hoka has added a few stability features to help move more hikers into their ultra plus shoes, and I for one am excited about the new offerings coming to market. It isn’t just the Tor Speed though, Hoka as a few more traditional looking hikers with leather uppers and durable carbon rubber outsoles. It will very interesting to see how these shoes feel on the trail, and how this maximal market continues to develop outside of running. Taking a page out of Adidas’ playbook, Salewa has teamed up with Michelin to help produce it’s next line of hiking shoes. For those of you unfamiliar with Salewa, they make a series of bombproof hiking and approach shoes. The most notable are the Wildfire and Firetail lines. This year, they are getting into the trail runner market with the new MS Lite Train and Ultra Train. The Michelin outsoles on both versions, look incredible. The Lite comes in with a 6mm drop, and the Ultra comes in at an 8mm drop. Both versions look to have a very secure midsole with stability elements through the arch. Both versions also include Salewa’s 3F fit system, and take it one step further by making it 3F total. The original 3F is the yellow Y shape you see on the heel. This locks down the foot for great stability. They’ve made this 3F total by adding the plastic grommets to the midfoot. This is a very intriguing addition to the light hiker category. Scarpa made a little noise in the trail shoe market with the release of the Spark in what seems like a long time ago. Scarpa is back this year with the release of the Neutron, Proton, and Atom. The Atom is a lightweight speed race of a shoe with a 4mm drop. The Atom is made for elite runner and those looking for a more minimal feel. The Proton is a more traditional shoe aimed at entry level runners and those who prefer a substantial trainer. The Neutron is the sweet spot in the middle. The Neutron has secure overlays with an arch wrap much like the Akasha. I can’t wait for the Neutron to be available, I have a feeling this is going to be a very popular shoe. There isn’t a lot of information out on the Olympus 2.0 yet, as all I was able to find was this photo. Still, the outsole shot has a lot to make me excited. I did a good deal of trail running in the Olympus 1.0 last year. It was a very nice maximally cushioned trail shoe with 0 drop. One of the notable issues with the first Olympus was the paltry outsole. Not only was the grip not very good, it broke down fairly quickly as well. The issues with outsole durability is something Altra has been dealing with across a few of their trail shoe models. Luckily, it looks like they’re switching to Vibram. This is a great sign, as outsole durability is really the only problem I’ve ever heard of people having with Altra shoes. This addition might add a little to the price, but it will be a great trade-off in terms of durability and grip. A huge step in the right direction for Altra, and I’m hoping to see a Vibram sole on the Lone Peak 3.0 for next year. The shoe looks to be pretty similar in stature to the Olympus 1.0 and 1.5. It looks like they’ve updated the upper of the shoe, but kept the exact same midsole. The All Out Crush by Merrell looks to be a nice lightweight mountain shoe for hikers and runner who want to move fast through demanding terrain. The upper looks to be made of a very breathable mesh and TPU wraps. The midsole is listed with a 6mm drop. This shoe uses the same TrailProtect pad for forefoot protection as you’ll find in it’s cousin, the All-Out Peak. Finally, the outsole has the M Select Grip for a tread pattern. Montrail used to be considered at the top of the trail running pack a few years ago. They’ve had a rough go of it the past couple of years, but appear to have things heading in the right direction once again with the Caldorado and Trans Alps. The Caldorado looks liked a beefed up version of the Montrail Fluid Flex ST, but it’s the bombproof looking Trans Alps that has me most excited. Everything about this shoe looks rugged. I haven’t used a pair of Montrail shoes since the original Mountain Masochists a few years ago, this is the model that could bring me back. I haven’t ran or hiked in a pair of Saucony shoes since the Peregrine 2 back in 2012. I really loved the feel and ride of that shoe, but had a bit of trouble with the outsoles. Four versions later, we’re now at the Peregrine 6, and my oh my have things changed. Saucony has gone away from using carbon rubber on the outsole, and has instead opted for a lugged-out sticky rubber. The Peregrine also comes with a nylon rock plate in the forefoot, a seamless upper, and a 4mm drop on the midfoot. I saw a lot of thru-hikers using this shoe on the PCT and JMT this year. I might have to give version 6 a test ride this year. Thank you for your research! Awesome! Great research! Even I keep looking out for new trekking shoes every now and then. What about new balance leadville trail runner ? Formerly the mt1210. Lawrence, I’ve tried on both the first Leadville and the Leadville 2, and had problems securing my heel in both. I’m not sure if it was the stiff midsole, or just the shape of the heel but I found my heel slipping up and out with every step. Other than that, a very comfortable and durable shoe. It just wasn’t for my foot. Any ideas on a release date for the 2016 leadville trail runner? It looks like new balance has changed it a bit.